The long transpacific journey over, my wife, Baraka, and I stepped onto Chinese soil, thrilled by the permutations of consciousness that this ancient, yet forward-looking land was already beginning to effect upon us. Our toddling daughter, Akasha, for whom any experience was a delightful curiosity, no matter how mundane or extraordinary her parents deemed it, took in her new surroundings with an uncomplicated wonder which we too, hoped to embrace despite the grown-up demands of intercontinental travel. Halfway across the world from the place we call home, the altered state that accompanied our desynchronosis actually helped fuel our excitement. The treasured relics of a bygone civilization, which we had yet to witness in the flesh, remained a mere un-air conditioned cab ride away. Holding wide-eyed Akasha in my lap, we made our way to the nucleus around which the traffic upon the six ring roads of Beijing orbited ― the onetime earthly abode of the Son of Heaven, the Forbidden City. Gilded rooflines boldly reflected the rays of the sun; intricately carved columns and statuary stood as testaments to the skill level of ancient artisans; stark expanses of weathered brick lay wide open to the vast firmament. What feats of human ingenuity these were, summoned from unfamiliar depths of dutiful obeisance to authorities, both divine and human, that once held sway. We had an odd feeling that we did not belong, not simply due to our round eyes and foreign tongues. Rather, we felt as if we were intruding upon a sanctum of ritual mediation between the sea of humanity and the cosmic will, encroaching upon a playground of dragons, who had long since hidden themselves from sight, trespassing into a forbidden realm of pleasure that could now be had for a hundred kuai.We had come to China primarily due to my devotion to the teachings of Chen Zhonghua, a master of Chen Style Taijiquan, who was conducting a full-time training intensive at Daqingshan Mountain Resort in Shandong Province. I would be both a participant and assistant instructor. To Baraka, this getaway meant a chance to write with sustained focus, free to create without the everyday distractions of home. We all were quite pleased that we would be spending so much time together as a family. We stopped to buy ice cream bars from a vendor situated in the shade of one of the massive arched corridors and I looked out upon the endless parade of tourists. At one time, outsiders like us would have received the punishment of “a thousand slices” for penetrating this palace so deeply. The tables had indeed turned. Those once sanctioned to live herein, in addition to having lost touch with the realities beyond these walls, eventually succumbed to the weaker parts of their nature, becoming drunk with majesty and complacently reckless in its administration. Assuredly, excesses and deficiencies within the empires longed to reestablish the state of balance achieved by kings of lore. Yet beyond the corruption which often beds with power, one can only imagine the splendor that such ritual purity might have cast upon the Earth had it ever been rekindled within the boundaries of such a meticulously designed vessel for such a flame. The construction of its 9,999 buildings had been overseen by the highest priests of feng shui; they remained standing as a geomantic invitation eagerly extended toward virtuous brilliance. Just as the great philosophers of this land once looked back to the sagacity of mythological kings for inspiration, I now beheld the handiwork of mere humans, not unlike myself, who had pushed themselves to the utmost command of their craft, thus fortifying my faith in my own abilities. Each detail enkindled within my chest a bristling determination to master not only the art of Chen Zhonghua, but the art of life itself. Emboldened? Yes. Yet, as I reemerged from my reverie, I found that we were surrounded by the red dust and bustle of a city now engulfed and begrimed by the sprawling monster of progress. It is, however, remarkable that we could find ourselves in total serenity within such a belching beast, either at the table of a hospitable family or beneath the shade of a tree at a popular park. Multitudes filled public spaces in the early morning hours, practicing vigorous diversions such as ballroom dance near the heavy foot traffic of the park gates or quiescent activities such as qigong under the rows of ancient cypress, offering passersby the illusion of escape from the swollen urbanity. Soon, however, our journey would lead us to a calm center of respite. Several days later, we were flying down the eastern seaboard from the capital to Qingdao, the low frequency rumbling of the jet engines lulling Akasha to sleep. Upon our arrival, we installed ourselves at a waterfront hotel and spent the next couple of days walking the white sand beaches of this former German concession and stocking up on baby supplies and other convenience items, for such treasures would be hard to come by at our final destination. The night before we left for Daqingshan, I sat by an upper story window sipping a Tsingtao lager and looked out over the shimmering Yellow Sea. Slow-moving Korean merchant ships drifted by. I wondered if the Eight Immortals were drinking now on the mystical isle of Penglai. In the morning, Master Chen’s driver, Tang, packed our belongings into a roomy, black sedan and we set out for Daqingshan. Clusters of nuclear silos punctuated the gloomy, industrial outskirts of Qingdao. Soon, however, we passed through verdant pastures and rich fields, rows and columns of well-managed tree farms, places of earth and heart. Wrinkled, sun-red men drove farm machines that had seen maximum utility wrested from their well-worn parts. I thought back to the small Georgia town where I spent long summer days on my great-grandmother’s farm, walking barefoot on red clay and through tall grass to feed saltlicks to purple-tongued cows. We finally arrived at a small hillside cabin, the place we would call home for several months. 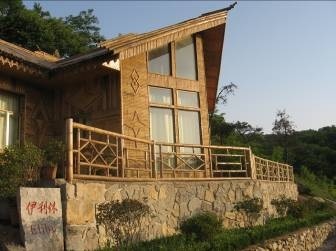 Its lacquered bamboo façade glowed golden in the late afternoon sunlight. From our front stoop we saw folks practicing the First Routine of the Chen Style Taijiquan Practical Method in silent unison on the half-shaded courtyard of the Yulange Hotel. On the other side of the hill from the cabin were luxuriant valleys which the local people have cultivated since time immemorial. We unpacked our possessions, our spirits adjusting to a pace of life guided by natural phenomenon; the cabin became homier with each passing moment.We pulled off the main road and passed through a dense chestnut grove, arriving at a gate where visitors normally paid a small admission fee to enjoy the splendors of this provincial forest park for a day. The driver beeped his horn to rouse the napping gate guard. Quickly perking up, the old fellow raised the gate and casually waved us on before peering through the window to check on the mushrooms he had drying on a newspaper in front of the guardhouse. As we ascended upon roughly paved roads, the driver shut off the air conditioning and rolled down the windows, softening us with cool breezes blown upward from valleys of locust blossoms. We were met by a quiet symphony of natural sounds ― trickling streams, trilling birds and the rhythmic call of a distant goatherd. 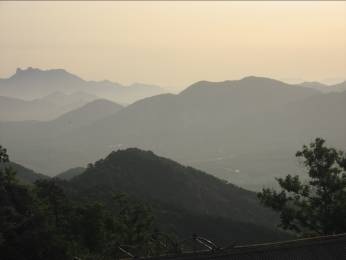 My wife’s eyes welled with tears, overcome by the unkempt beauty of the wilds of Daqingshan. I had come here as a disciple, an adherent, a sponge. I had come here, to the homeland of my teacher, in order to ensure that the transmission of a traditional martial art would remain unbroken, from his generation to my own, from my own to futurity. Master Chen, met us at the door of our cabin, abuzz with excitement, tucking an iPhone into the pocket of his slacks in order to shake our hands with both of his. The sizable contingency of students which had already convened upon the mountain was a source of joyous energy for him. He briefly brought us up to speed on the recent goings-on, and we followed him down to a banquet room where we were regaled with a sumptuous selection of local specialties: steaming dumplings filled with minced pork and a seasonal wildcrafted pulse, stir-fried wood ear, sautéed cucumbers, pickled chicken feet, tender chevon drowned in a savory brown sauce, flaky onion cakes, glutinous pastries filled with red bean paste, and juicy watermelon. Well-satiated, we sauntered back to our dwelling in the pale light of the moon, wherein we were lullabied by the subtle interplay of the languorous wind with the mildly resonant bamboo. I awoke the next morning with the reddening of the eastern penumbra. The sensuous downward curvature of the surrounding hills opened themselves to a transient array of clouds, which despite their rapid procession, calmly veiled the source of their warm illumination. I found my way out to the unconfined courtyard where other students had already arrived in order to warm their blood, but I remained fixated on the amorphous regularity of the vast display of clouds. Below, the mountainous protrusions gave way to cultivated flatlands, creating the epitome of solidity. Above, the incessant altocumulus drifted by, effortless and ephemeral. I began shadowboxing, and felt myself merge with the scenery that lay before me. My lower body became the landscape, which, though it seemed to be static, was actually grinding with immeasurable force beneath its surface. My upper body transformed into the now ocherous clouds. These masses of vapor had drawn corporeality from the elements of the earth, an entity which, in fact, exhibited a tethering influence upon them lest they were to float off, unchecked, beyond the atmosphere. Like this oneness of Heaven and Earth, I, as the observer, had become the observed. The morning matured, and the golds and yellows of the sky gave way to a dense grayness. I wiped the sweat from my brow; large droplets darkened the granite pavers below my feet with increasing frequency. The dark continuum, the pluvial blurring of land and sky, thundered toward us through the distant valley. Clouds are not merely whimsical puffs, I reminded myself, but also possessors of dramatic potential, interrupters of human affairs which, under certain circumstances, can be transformed into violent tempests and swirling vortexes of destruction. So it is with fists. Sensing that my outdoor training time was about to be cut short, I picked up the tempo and intensity of my performance. In my mind’s eye I not only conjured images of Master Chen at his most formidable, but also make-believe assailants whom I dispatched with quick ferocity. The fast-twitch musculature of my body exploded with elasticity as I both issued energy beyond my carefully aligned frame and rapidly recoiled it within. It is said that Feng Zhiqiang, Master Chen’s living master, gained invaluable insights by consistently volunteering to be the crash test dummy upon which his teacher, Grandmaster Chen Fake, would administer jarring throws or crushing blows. To an outside observer, Feng’s gluttony for punishment might have been judged foolhardy. However, Master Feng seemed to have learned early in his training that by physically experiencing the violent potential of his teacher’s movements, he could bypass the filters of his mind and transfer knowledge directly to a part of his consciousness inaccessible by any other means. His body learned what his mind alone could never apprehend. Even though he may have walked away from such demonstrations feeling beat up or nauseous, he had gained hard-earned knowledge that could never be won by those on the sidelines. On this morning, my learning opportunity is not destined to have quite that same character of pummeling. Master Chen holds his latent ferocity in check. He instead creates for me an intoxicating and perplexing sensation of constant instability and awkwardness. The Italian marble floor under my feet seems to undulate and warp. This was a feeling characteristically experienced by those who pushed with Master’s Chen’s late master, Hong Junsheng, a feeling intoxicating in its perplexity. Even though Master Chen still has sleep in his eye, his body is nevertheless awake. Whenever I attempt to push or pull him, his body follows with the precision of a machine, but in greater proportion to the initiating movement. The effect is not unlike an unexpectedly responsive revolving door that speeds up and hits you from behind before you can exit. His mind seems empty. His body, deeply programmed by years of intentional practice, is simply on autopilot. At times I will feel I have the upper hand on him. Then his intention flashes like a surge of electricity. The next thing I know, both of my feet are off the ground, and I am reeling backward both puzzled and delighted, with no idea what just happened. In those moments, what I want the most is to repeat the whole scenario so that I might catch what I failed to perceive the first time. After granting me this unspoken lesson, Master Chen asked another student how the newly acquired bage birds were faring and explained to us how they could be trained to talk. The storm clouds had now blown over, so he wandered off with a childlike enthusiasm to inspect some recent plantings along the perimeter of the courtyard. Having established this mountain enterprise just a hop, skip and a jump from his old hometown, he seemed to revel in these natural wonders of youthful familiarity. Keen to behold aspects of the mountain which had been enthusiastically described by Master Chen in glorious detail, I ventured forth one foggy morning to explore the lush environs. A hundred yards north of our cabin, I passed a pale statue rising out of a sea of yellow daisies, the larger-than-life likeness of Liu Bang, founder of the Han dynasty. Over two thousand years ago, Liu Bang had wintered on this mountain with his rebel army before launching a decisive campaign against the internally collapsing Qin dynasty.I returned to the drenched courtyard and went through the First Routine several times in an attempt to integrate the subtle alignments I had just seen and felt on Master Chen’s body. Each day I engaged in this process of reshaping myself, guided by the observations culled from close contact with the expert hand of my teacher. Such work slowly began to dominate my unconscious; at night, I often woke myself from playing Taiji in my sleep. I followed the rain-dimpled trail past Liu Bang and into the welcome shade of overhanging black locust branches. A stern man in military uniform and a woman whose plainness was offset by her watery almond eyes passed me from the opposite direction. Soon I came upon an enormous, phallic rock formation. Local legend tells that Lü Dongbing, perhaps the most venerated of the “Eight Immortals,” ascended to heaven from this particular spot, leaving in his wake an abundance of yang energy in the form of this granite erection. Just beyond this surprising outcropping, a tonsured monk waved to me from the steps of a small Buddhist shrine. According to the locals, this monk had taken residence near the shrine in order to regularly minister to couples hoping to conceive a son. Perhaps the man and the woman whom I had just passed had come here to display their sincerity and to benefit from the yang energy of the place. I had heard that, embraced by its globalized metropolises, China’s expanding economy now placed greater value on one’s business acumen than on one’s gender; here in the countryside it seems old preferences die hard. I soon reached the summit where I discovered a whitewashed pagoda. Climbing the steep stairs to its uppermost stories, I enjoyed a commanding view of the area, an enjoyment only slightly tainted by the acrid aroma of guano. To the north and west lay wooded mountains; to the east, granite quarries dotted the low-lying plains, their presence barely discernible by sight, but announced daily by means of thunderous blasts. In the hills that lay to the south, nestled amongst familiar buildings, I knew that my wife was sitting in our cabin, finishing the manuscript of what would be her first published book, an ode to the creative process of women. I left the pagoda and descended eastward upon the “Eight Immortals Trail,” where I soon found myself traversing enormous boulders, the random layering of which produced a series of caves varying in accessibility. I lowered my body into the cool exhalation of a particularly large opening of unknown depth, a welcome respite from the stifling humidity of the forest outside. 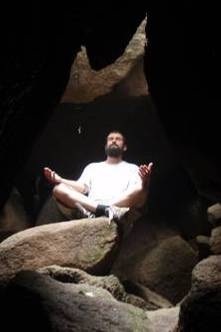 Ancient hermits were said to have sought retreat within these dim, damp fissures of meditative withdrawal. I looked for a spot in which I could sit undisturbed in silent contemplation and discovered a nice seat of stone illumined by a beam of sunshine penetrating the cavern from above. Rumor held that Lü Dongbing, the selfsame immortal who supposedly left a mineralized phallus as his last earthly relic, had cultivated his ascendant yang energy within one of these moist wombs of spiritual maturation. I sat, timeless in that sacred space, concentrating on my dantian, forgetting all else. I emerge from such subterranean peace fully present in the moment and am greeted from above by the raucous calls of invisible birds, hidden by thicket and cloud. Suddenly, one materializes from the mist and soars overhead. I close my eyes and imagine its point of view; from high in the mountain air, I scan the tenaciously forested mountainside, hardly noticing the bearded man clinging to one of its rocky protrusions, overwhelmed by the alluring immensity of the scene. The author sitting within one of many caves upon the "Eight Immortals Trail"
I could have spent days wandering the wonders of Daqingshan, yet the real reason I was here was, of course, the intensive Taijiquan learning environment. In the relatively cool weather of the early mornings and late afternoons, Master Chen would offer mind-blowing instruction on anything ranging from the distance-minimizing qualities of geodesics to the vertical neutralization of a horizontal force. When he was not around, I worked with the other students in order to make sense of the new information and to restructure my body accordingly. At some point during the dog days of summer, a couple of Master Chen’s disciple-brother’s came to call on him. When not catching up and sharing stories, they were engaged in a serious exchange and proofing of martial theories. I was a rapt observer. It is one thing to watch Master Chen interact with his students; it is another matter altogether to witness him interact with his peers. The profundity of such matching of skills is rarely seen. Observing the interplay of these masters was like witnessing immortals playing chess within an otherwise inaccessible pavilion atop some remote peak. One evening, the masters watched the students practice from a flight of stairs that faced the moonlit courtyard. I had just joined the group after putting Akasha down for the night. Master Chen’s nephew had come to visit during his summer break from college in order to start learning the art of his uncle; I was directed to push hands with him. As he pressed hard against my arms, I braced the incoming force with my rear leg. Then, slightly sinking my rear hip and rounding my back, I simply rotated my arms as I had been trained to do in the form “Brush the Knee.” Suddenly, the young man shot up into the air. His body spun counter-clockwise to my left and landed behind me. I stood there as if I had just finished a movement in the barehanded form, perfectly positioned, but suppressing a grin. I turned to help him to his feet. Master Chen smiled and said that I was “getting somewhere.” Up until this moment, push hands had largely felt like wrestling; this had been something totally different. I had hardly moved or exerted any effort, yet the effect on my opponent had been astounding. I had seen and felt Master Chen pull this type of thing off many times, but my attempts at reproducing it had always been less than perfect. It seems that the consistent observation, instruction, analysis, and experimentation over several months had borne an almost imperceptible influence upon myself, like a river that slowly shapes a stone that it ripples over day by day. Day in and day out, I undertook the preparatory work for such epiphanies with great persistence until it was finally time to return to a world of expanded responsibilities. After three months of life on the mountain, we bid farewell to Master Chen, and were conveyed down the winding cobbled road in the black sedan through a thick fog, acknowledging every rock, tree and bubbling spring. We had accomplished what we had come for. Baraka had birthed her book, a brainchild which lacked only the caring eye of an editor. Akasha had happily received oodles of attention from her parents and had been treated as some sort of fairy being by the child-worshipping locals. I had undergone the rewarding rigors of an otherwise unrealizable training experience. Though I longed to return to such a regimen amidst the exquisite environs of the fabled haunt of immortals, my process of forging was over for now. Guided by my teacher, I had been imperceptibly recast by my own efforts and was quenched by the final communion with the excruciatingly beautiful surroundings of Daqingshan. The memory of the body was fresh and time was of the essence: the tempering process lay before me. This entry was posted in Experience Exchange and tagged Chen style taiji, China, Daqingshan, Master Chen. Bookmark the permalink. I am thrilled in discovering your site and hope to learn and improve my knowledge. 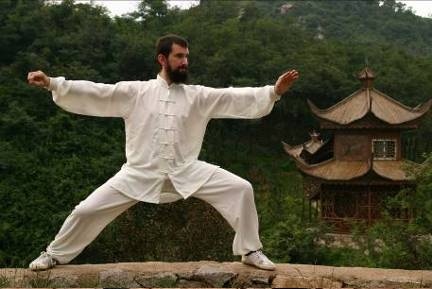 Accidentally I discovered this site and hope to read, learn and practice to improve my Taijiquan.